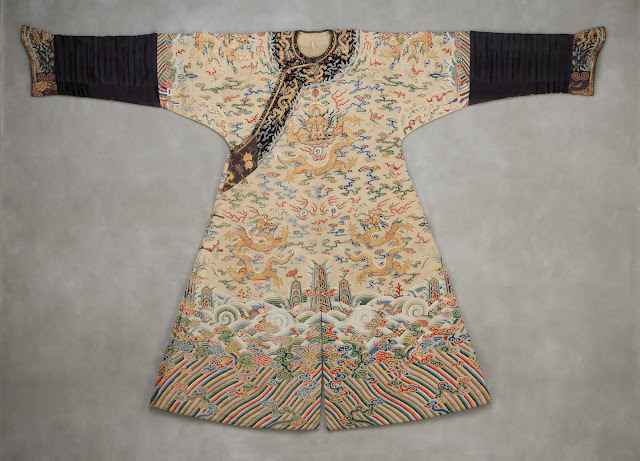 Today I will talk about the garment which is perhaps the epitome of embroidered clothing [although some were woven, either brocade or tapestry], The Dragon robe of the Qing [Ch'ing] Dynasty of China. 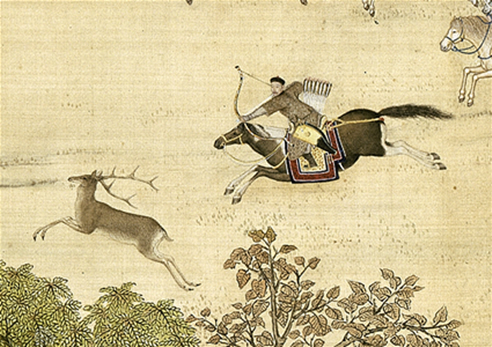 In 1644 the Manchu declared the official beginning of their rule over China, having been able to breach the wall and conquer the Middle Kingdom. 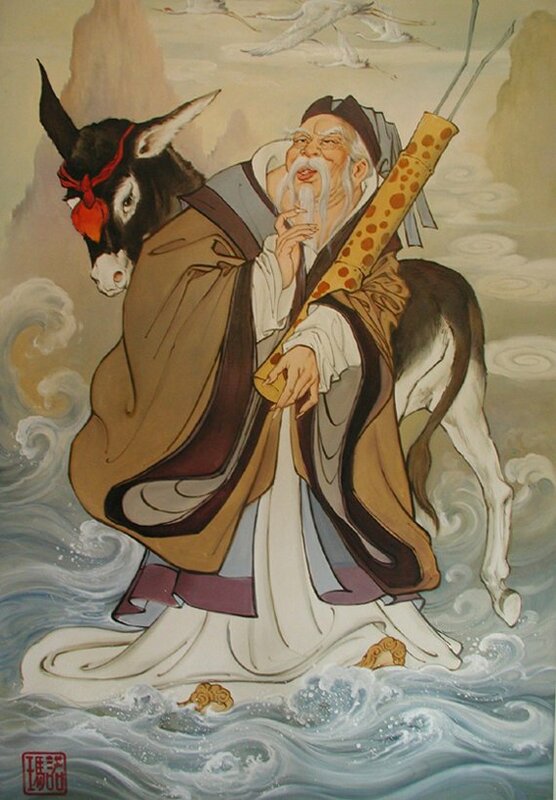 中国人,which refers to anyone who inhabits China, regardless of ethnicity; this might be translated as 'person of China'. There are tens of millions of people of many other ethnicities which also inhabit China, Uigur, Mongols, Xibe, Tibetans, She, Miao, Tujia, Bai, Zhuang, etc. 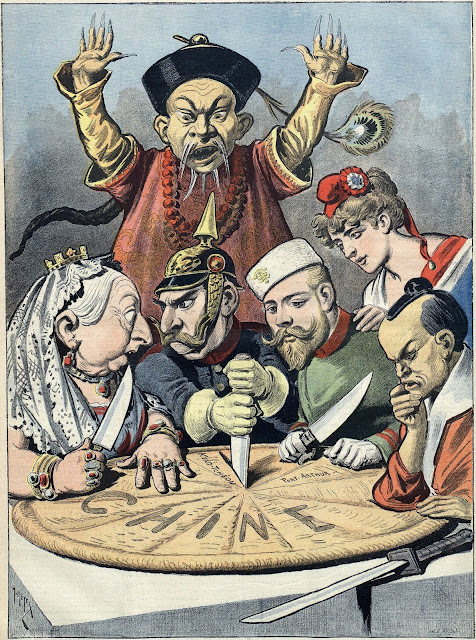 The Manchu were well aware of the fate of other foreign groups who conquered China only to be absorbed and assimilated by the Chinese, and from the outset established laws and customs to segregate their people. 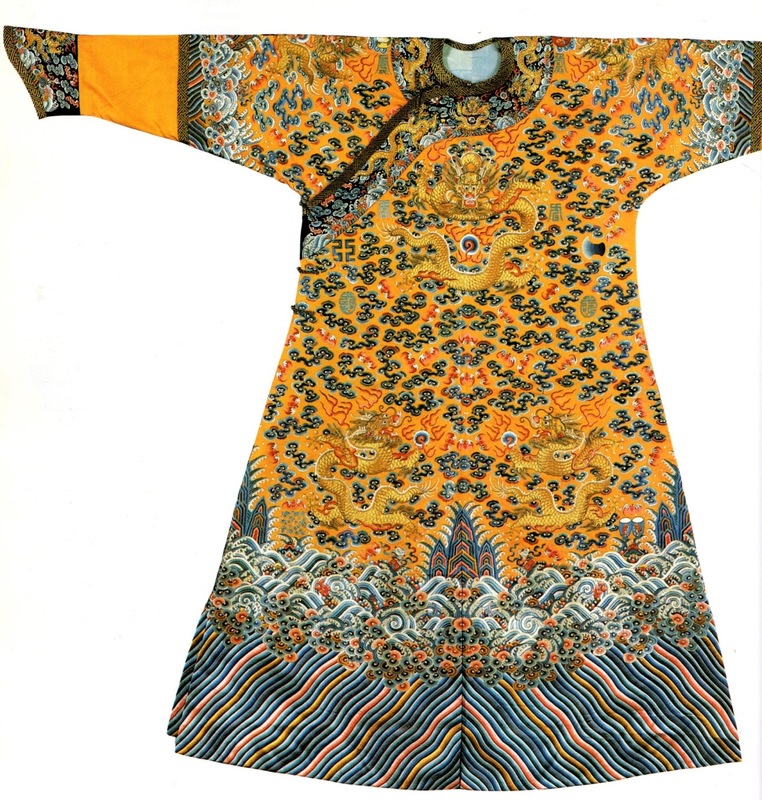 One of these was to forbid Manchu from wearing Chinese style clothing, and indeed to impose Manchu clothing on anyone who served in governmental office. 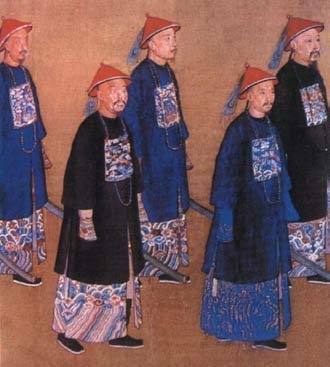 Another law was imposed on all Chinese men that they had to wear their hair in a single braid at the back of the head, in the Manchu style. 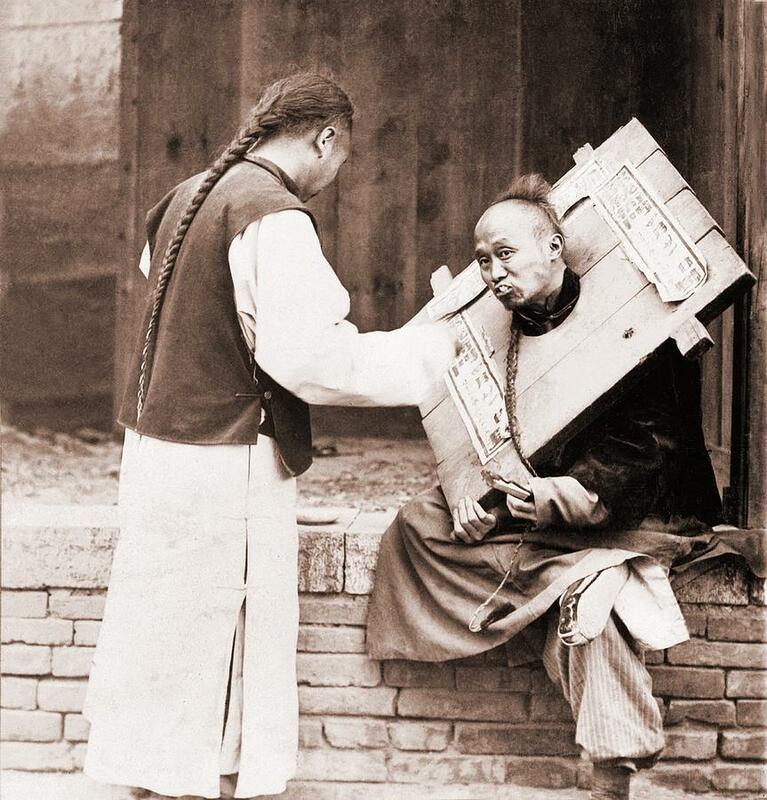 Here is an old photograph from that time period, showing a man feeding another who was in the stocks. 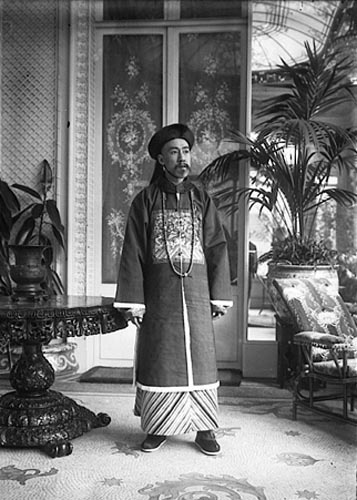 Since the Manchu rulership of China extended from 1644 to 1911, many in the west were under the impression that the imperial Manchu robes which they saw ambassadors, etc wearing was Chinese dress. Here is a cartoon from 1898 showing Britain [Queen Victoria], Germany [Kaiser Wilhelm], Russia [Tsar Nicholas], France, and Japan dividing up China, here represented as a pie, while China protests helplessly. 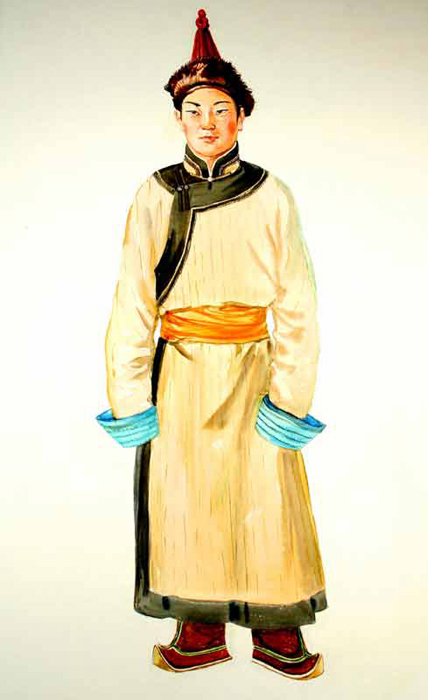 The figure representing China is in a caricature of Manchu court dress. Here is a painting of the opening of the Great Exhibition in Britain in 1851. 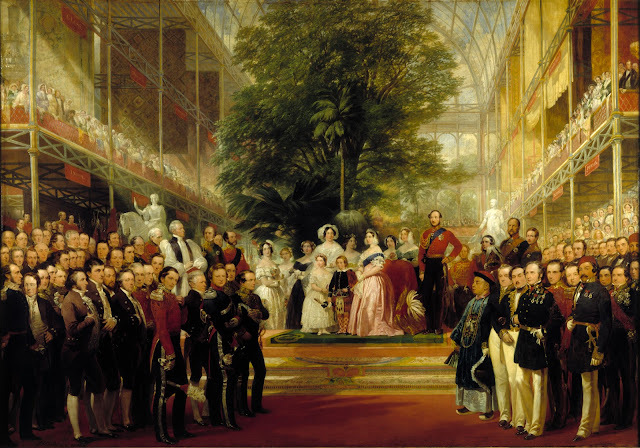 A figure in Manchu robes can be seen among the guests. Here you may see officials depicted. 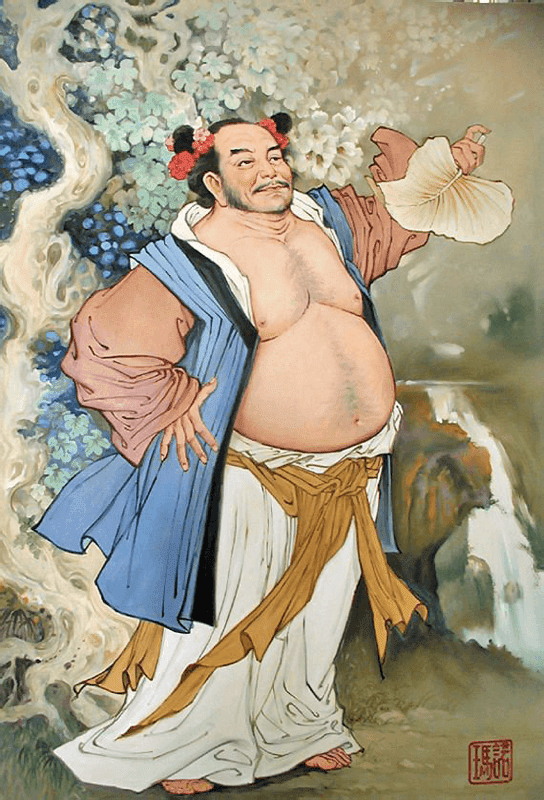 After the humiliation of Manchu rule, followed by ruinous Western and Japanese Imperialism, then the crushing 'cultural revolution' of Mao, Many ethnic Chinese are seeking their own cultural identity, and one facet of this is the movement called 'Hanfu'. 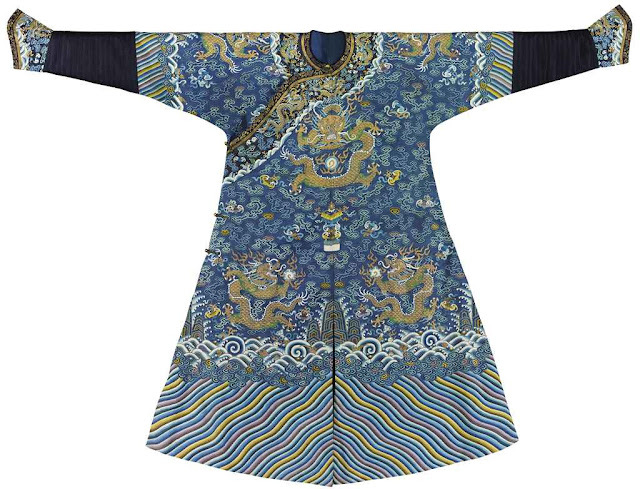 This is the adoption of traditional ethnic Han Chinese clothing, for which they have to return to the Ming Dynasty, or even further back to the Tang or Sung Dynasties. This topic will have to be saved for another article. The garment which I will speak about was called in Chinese Ji-fu [Ch'i-fu]. I have not been able to find the name of the garment in Manchu. In the west, these garments are usually called 'Dragon Robes'. Here is a spectacular example. 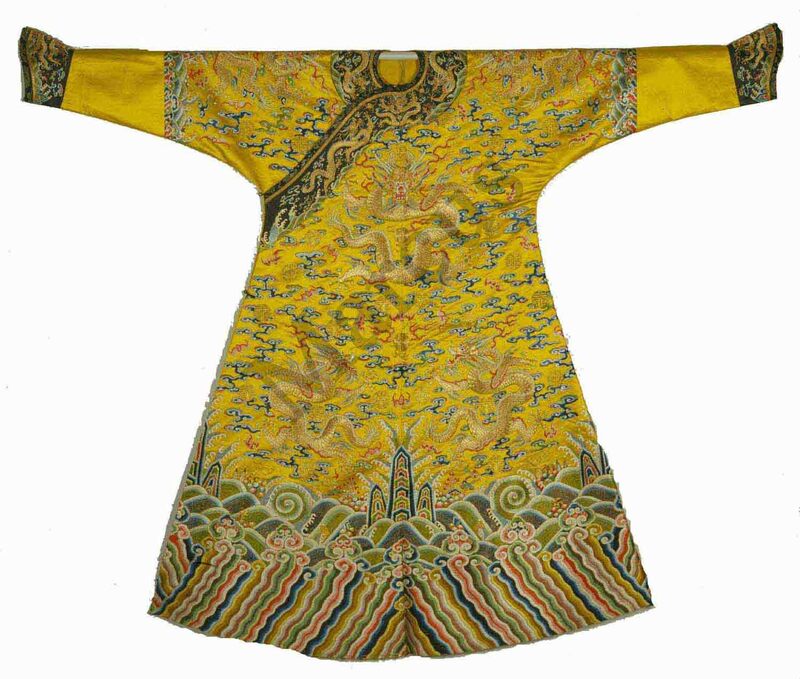 This particular robe would have been worn by the emperor himself, as is indicated by the background color of clear yellow [the Imperial color], and by the symbols included in the design. The cut of the robe is pure Manchu, but the expertise of production of the silk, the embroidery, and most of the symbols and symbolism of the robe are Chinese, so this might really be considered to be a hybrid garment. The Manchu did not fully succeed in maintaining a separate culture. The Chinese traditionally wore the P'ao robe, which opened in the middle with some overlaps and had very wide sleeves. 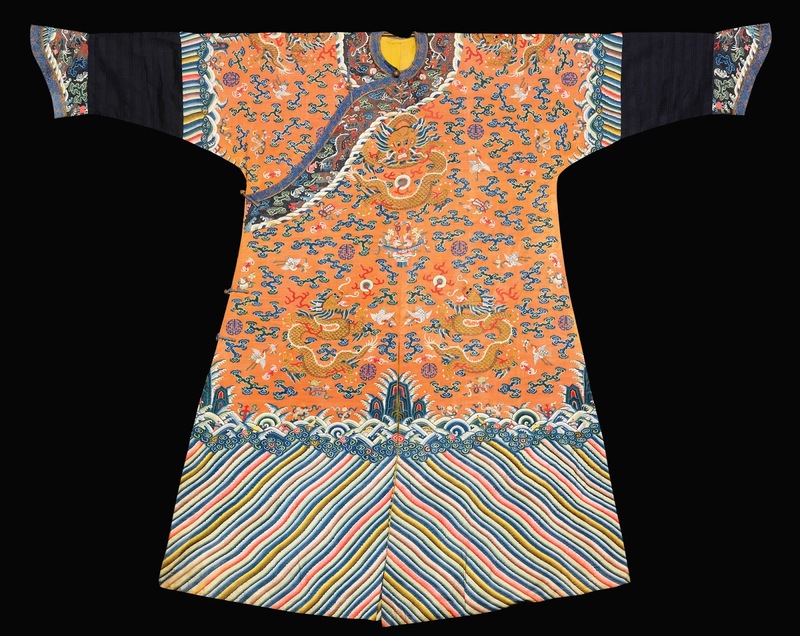 This was the original inspiration for both the Japanese Kimono and the Korean Dopo. 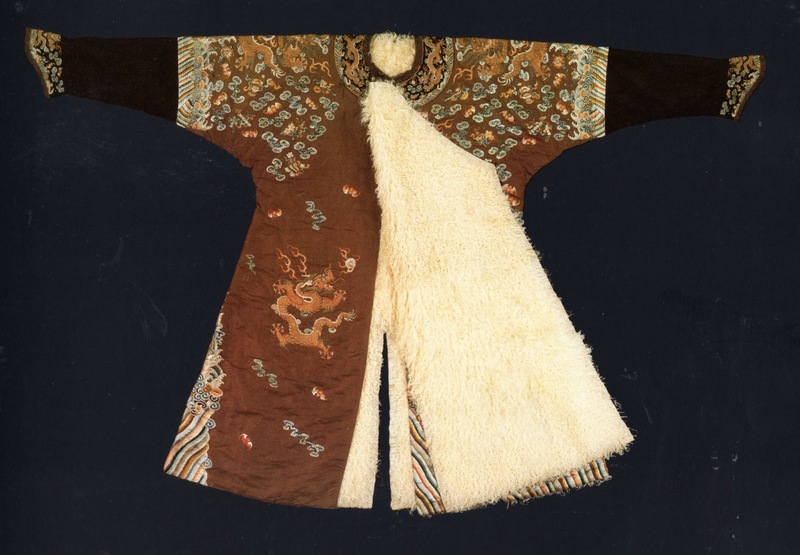 The Manchu found this to be not only foreign, but also cumbersome and effete. 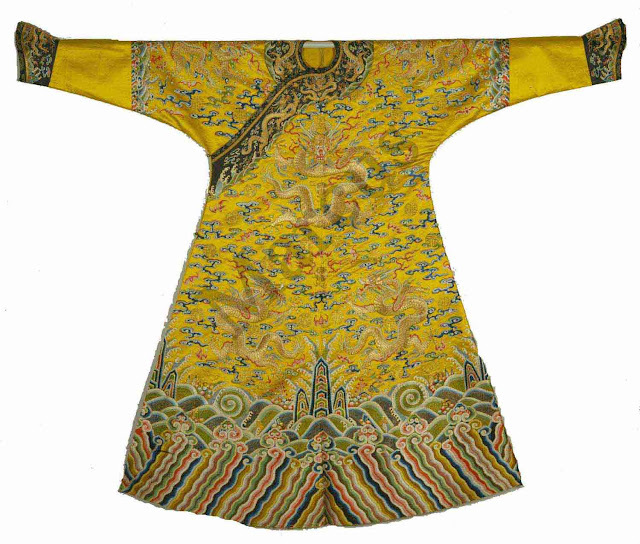 The traditional Manchu robe was cut closer to the body, and allowed freedom of movement to ride horses and shoot arrows. 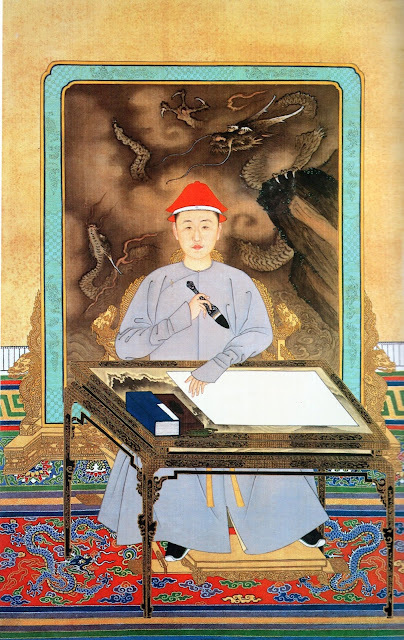 Here is a painting of Emperor Kangxi in informal Manchu robes. This same cut was used in the dragon robes. 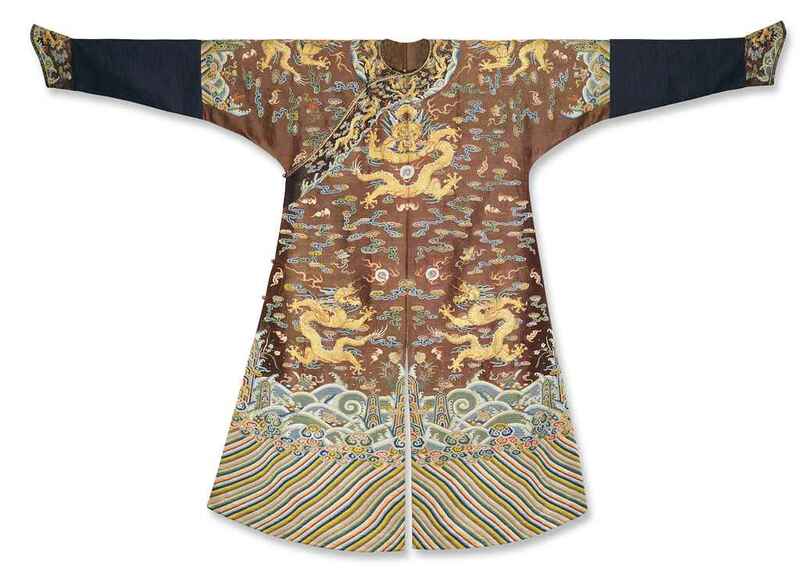 Some who wrote about this garment, [e.g. 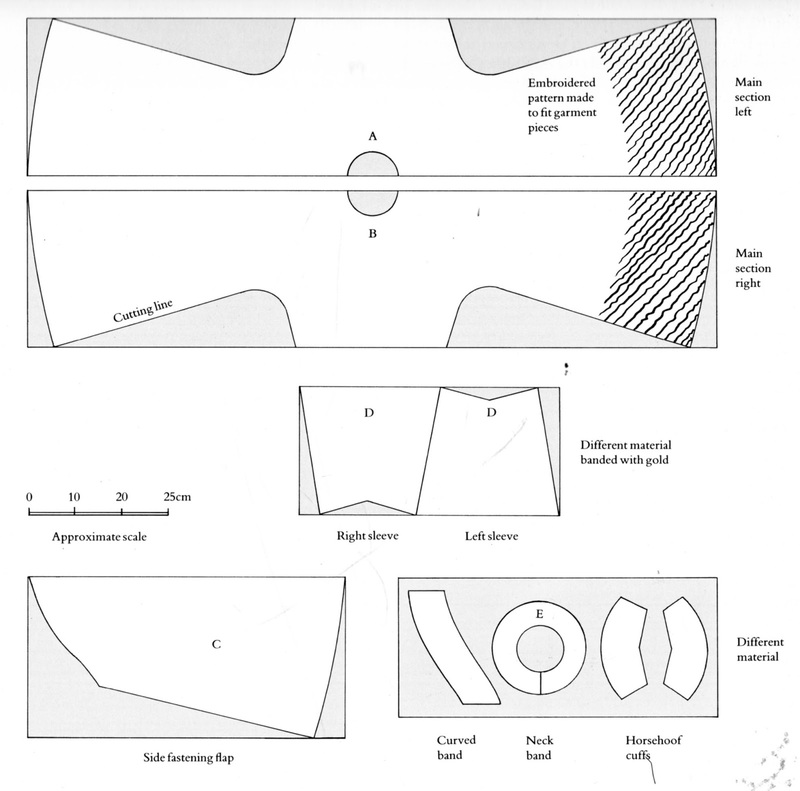 Schuyler Cammann] find the seam halfway down the arms to be 'inexplicable', and have come up with strange theories to explain it. It is however, extremely clear if you look at the garment's construction; The upper part of the 'sleeve' is integral to the body of the garment. 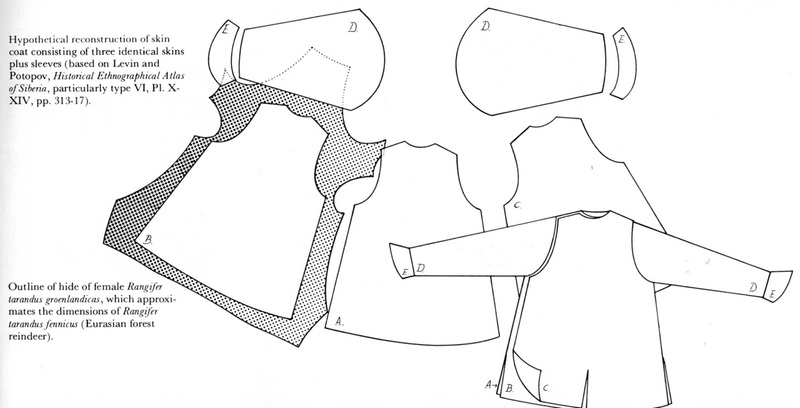 The lower sleeve starts at the selvage, and was either made of the same material, or a contrasting one. 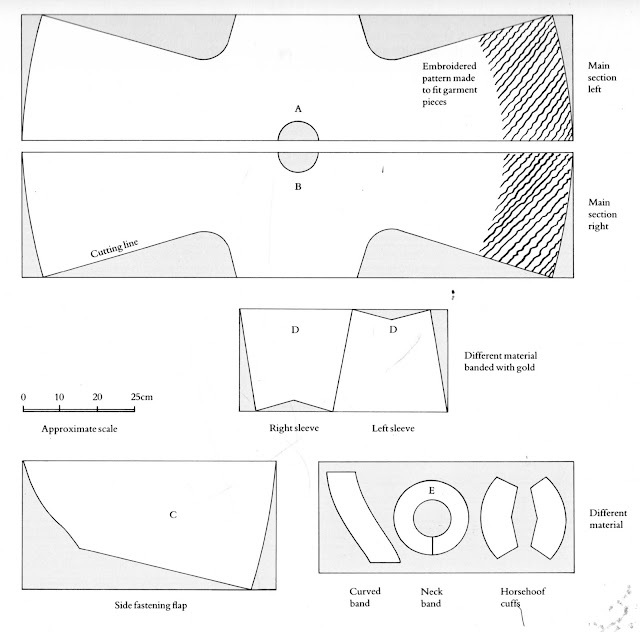 A horsehoof cuff covers the hands. The Manchu robe for men was slit front and back, to allow for horseback wear. 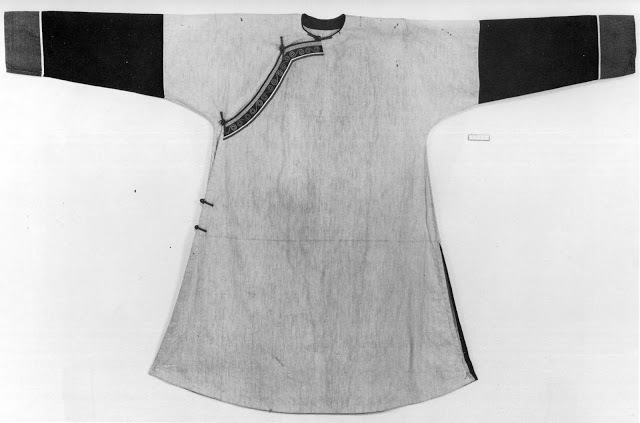 This cut, while foreign to the Chinese, was common enough in the north. 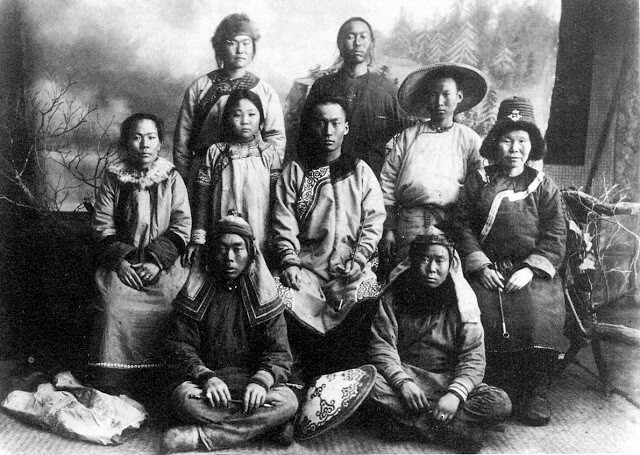 The Nanai are relatives of the Manchu, who live to their east. Here is a Nanai family. 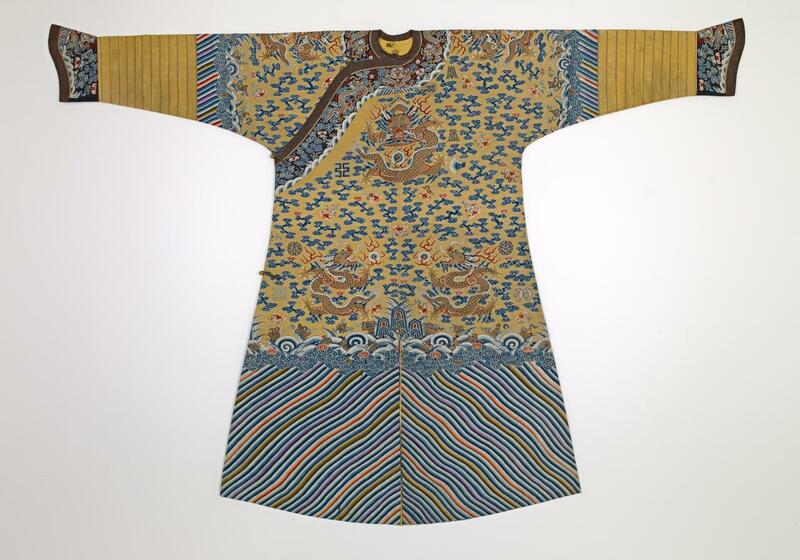 Here is one of their robes pieced together from fish leather, and another one of trade cloth. 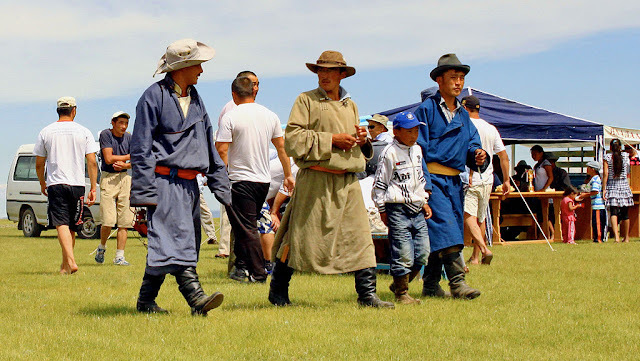 The Mongols, while not closely related to the Manchu, had a similar culture and bordered them on the west. They also wear similar robes to this day. 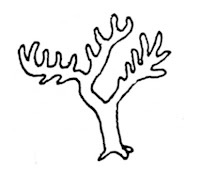 Some have theorized that the difference in cut stems from a time when the northern peoples designed their clothing based on the shapes of animal skins. One such offers this hypothetical 'reconstruction'. 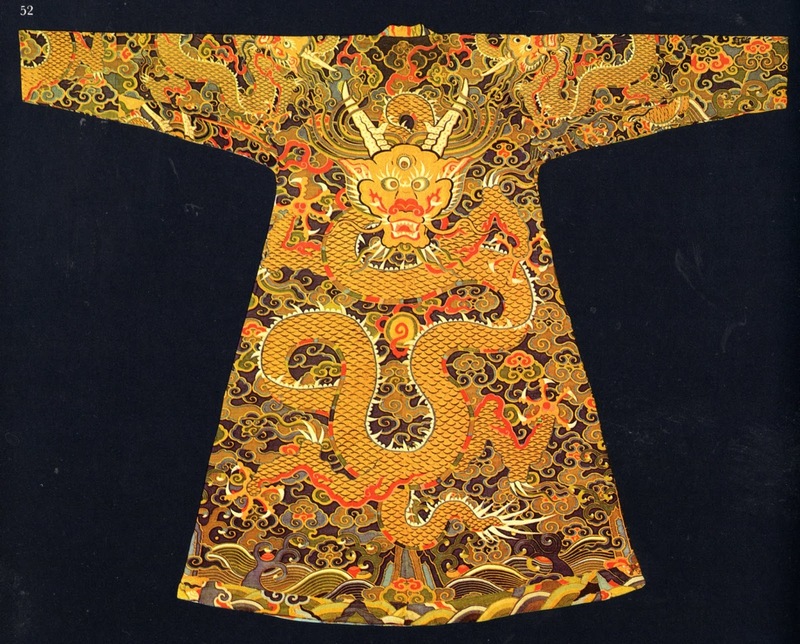 I will now turn to the ornamentation and symbolism of the Dragon Robe. I often dismiss talk of symbolism in embroidery, but here it is intentional and explicit. Firstly the dragons. In the west, dragons are considered to be aggressive creatures that den in the earth, and breathe fire. 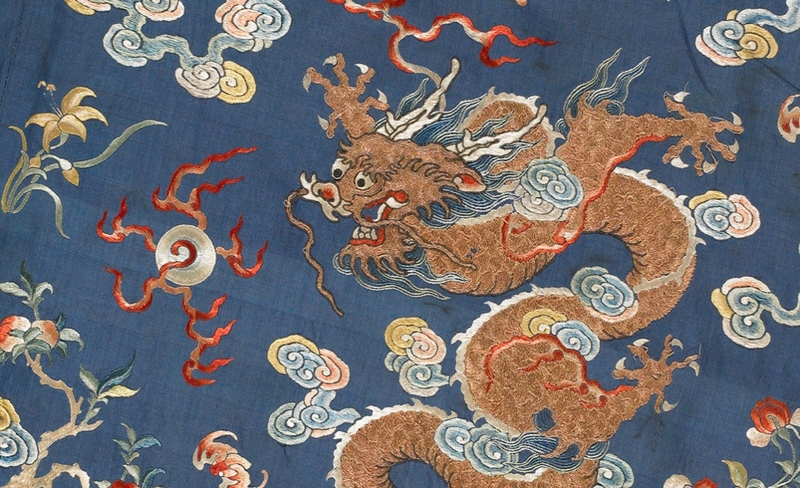 In China and the Orient, however, dragons are considered to be benevolent and auspicious creatures of water and air. They live in great waters, and have control over clouds, mist, and rain. They are wingless and do not truly fly, however they can swim through the air. 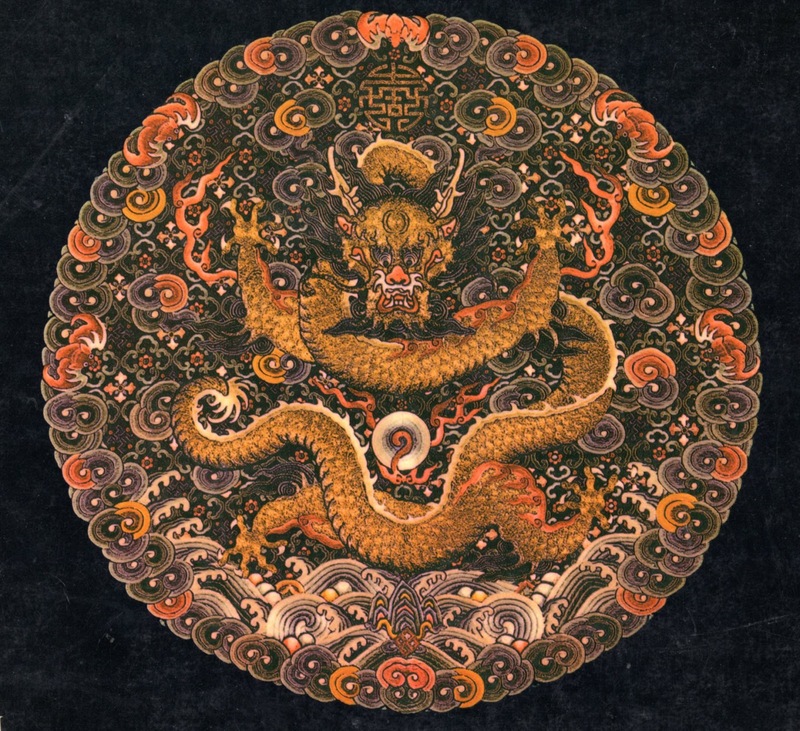 The dragon has the head of a camel, the horns of a deer, the eyes of a demon, the ears of a bull, the neck of a snake, the scales of a carp, the belly of a sea serpent, the claws of an eagle, and the pads of a tiger. He also has a protuberance on his head, as you can see here above, that confers his powers upon him. 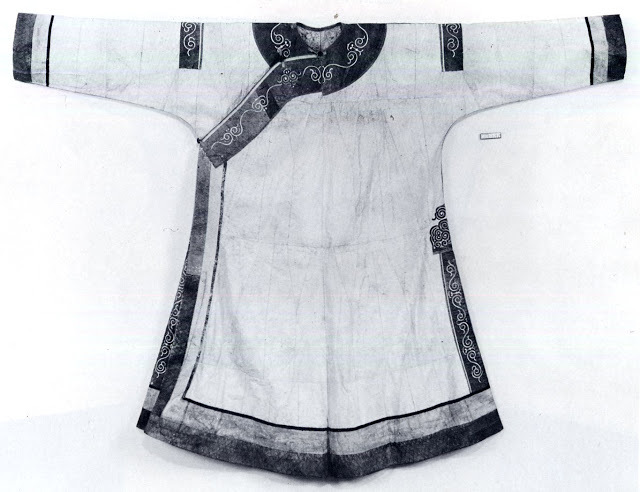 [This might be a Buddhist addition] This is occasionally shown as a third eye, as in this Tibetan robe. The Dragon is a powerful Yang symbol, and a fitting symbol for the Emperor, as the Phoenix is for the Empress. Early dragons were drawn with three toes, a powerful yang number. 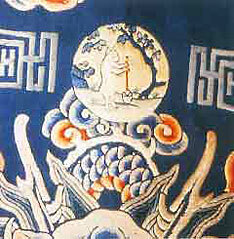 Later, the Imperial dragons, Lung, were drawn with five toes, while lesser dragons, Mang, were drawn with four toes. Five is a yang number, while four is yin. 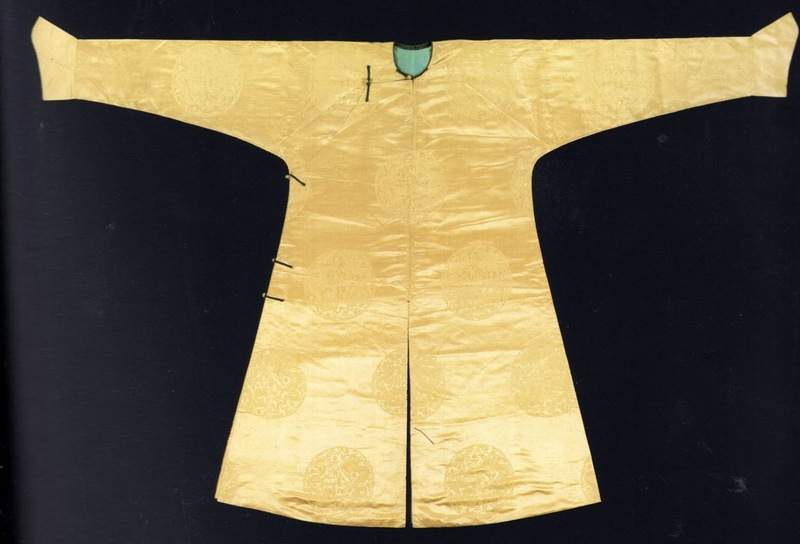 In theory, the five clawed lung was only supposed to be worn by the emperor, his immediate heirs, and occasional people upon whom this honor was bestowed. Lesser officials and nobles had to be content with mang, while commoners were not allowed to wear dragons at all. Like so many laws of this type around the world, however, this one was often broken. 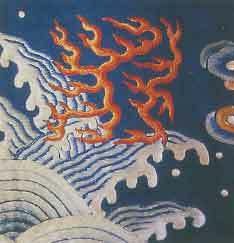 The dragon is usually shown chasing a flaming pearl through the clouds. The original meaning of the flaming jewel seems to have been lost, but it is interpreted by Buddhists, and perhaps even Taoists as standing for enlightenment, wisdom and spiritual essence, which it is imperative that all constantly pursue. 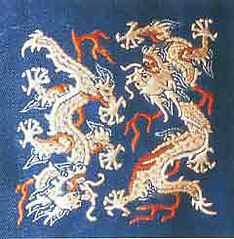 There were at first various ways in which the dragons were arranged on the robe, but in 1759 it was decreed that most officials would have 8 mang dragons, one each on the chest and back, one on each shoulder/upper arm, and two each on the front and back of the lower part of the robe.The dragons on the upper body were usually shown full face, while those on the skirts were shown in profile. Noblemen could wear nine mang, Princes and high officials could wear eight lung, and the emperor and his heirs would wear nine lung. The ninth was on the underlap, and did not show when the robe was closed. 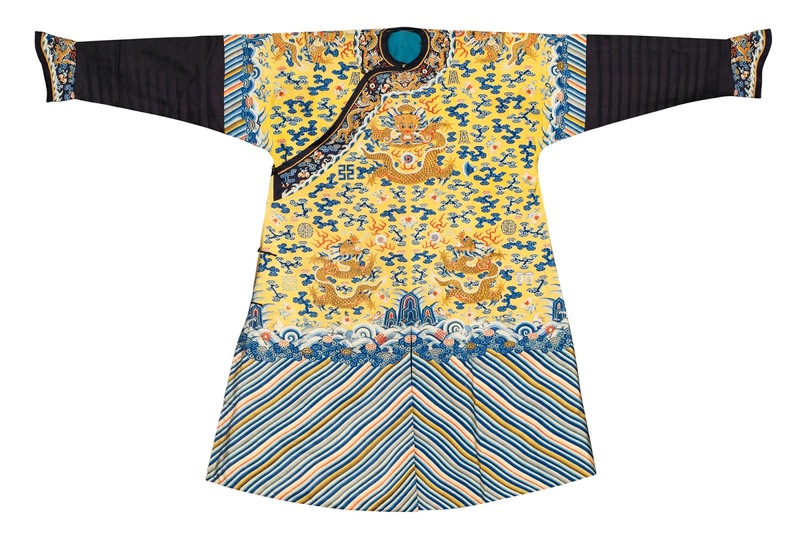 Here is a fleece lined winter robe. 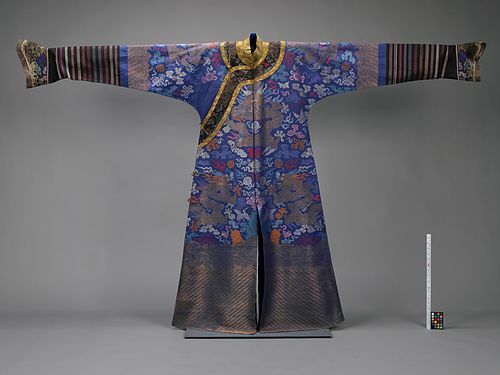 The composition of the robe is a schematic diagram of the universe as a whole. 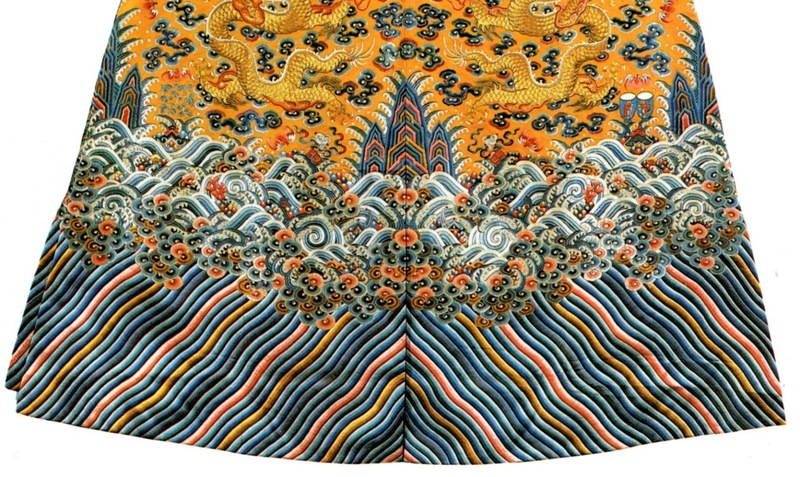 The dragons form such a strong yang component that they have to balanced with an equally strong yin component, so the hem of the garment is embroidered with the world sea, water being yin. The surface of the water is shown with turbulent waves, below which are the still deep waters represented by undulating stripes. 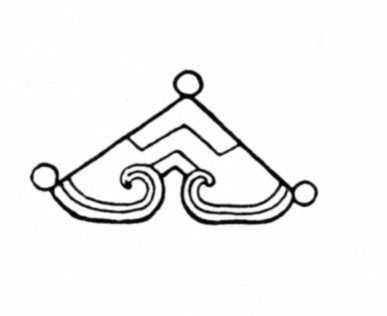 The world mountain, K'un Lun is shown at the four cardinal points of the garment, the five peaks being shown from each side, one of which always hidden behind the others. 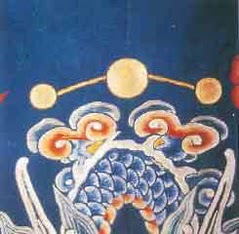 Above this is the firmament, with five-colored clouds, a good omen, filled with dragons and the symbols of imperial authority and good fortune. 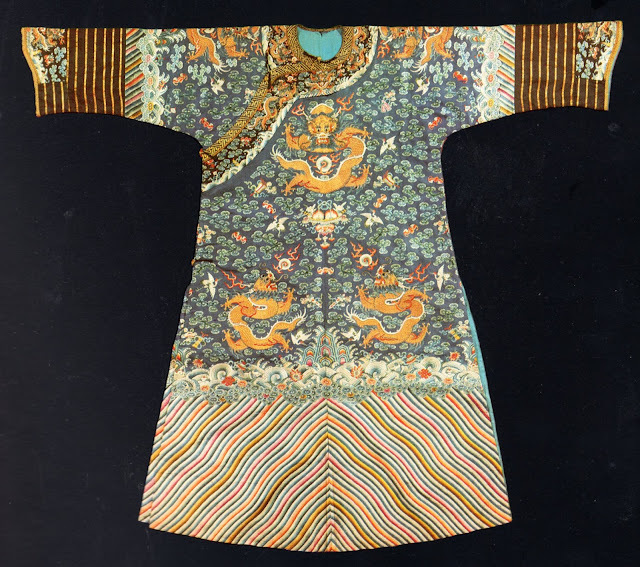 The neck opening becomes the gateway to heaven when the garment is worn, the human body being the world axis, and the head of the wearer representing the realm of the intellect and the spiritual. 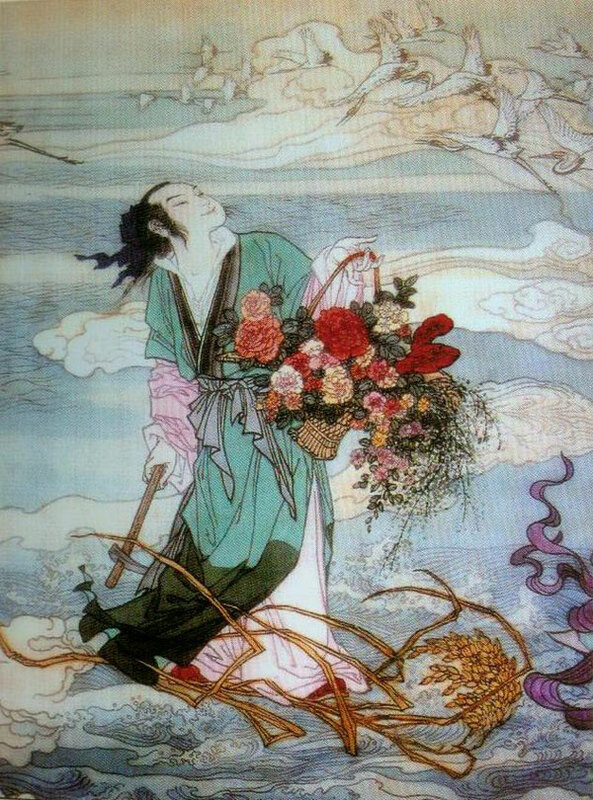 If you look carefully at the image above, you can see the waves bearing colored pearls and branches of precious coral, two of the symbols of wealth. 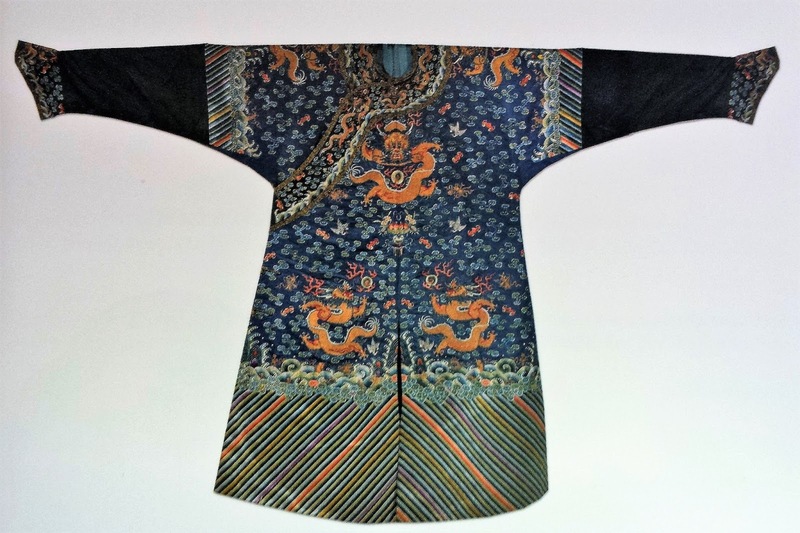 The 'eight' precious things are very commonly added to many Chinese compositions in any medium and are prescribed for the dragon robes since 1759. 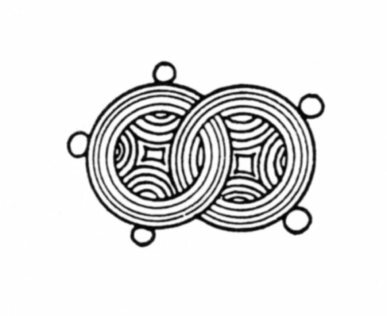 There are in fact more than eight, but they are always shown in groups of eight, that being the number of completeness. 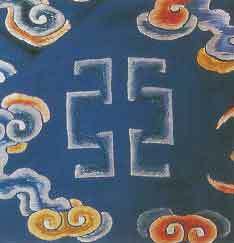 You will also often find the eight Buddhist symbols and the symbols of the eight Daoist Immortals. 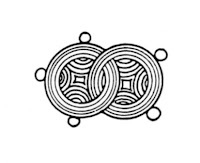 The symbols are not uncommonly mixed, but there are always eight of them. and bolts of silk, later sometimes shown as scrolls. These symbols are so old, that many of them were replaced or reimagined, a common addition being an ingot of precious metal. Much better defined are the other two groups of eight. 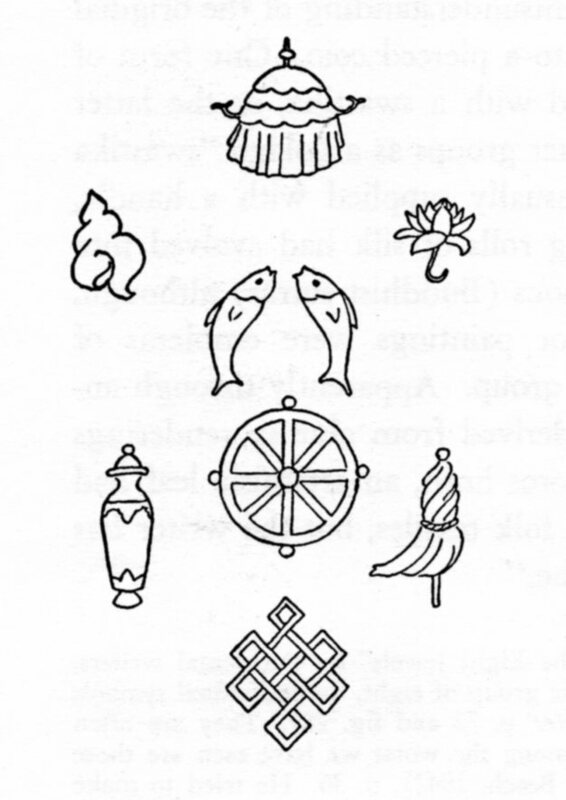 The eight Buddhist symbols are shown here. 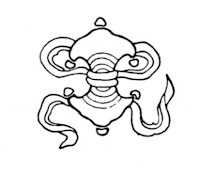 These are, from the top, the canopy, which symbolizes protection, the conch shell, which calls the faithful to worship, The lotus, which represents purity growing from mud, as enlightenment grows from the material, The paired golden fish, for the Chinese a symbol of plenty, for the Buddhists, freedom from fear to move in the correct direction, the dharmachakra, or wheel of the eightfold path, which represents the teachings of Buddha, the vase of treasure, The victory banner, sometimes called an umbrella, which symbolizes the overcoming of obstacles, and the endless knot, symbolizing the infinite mercy of Buddha. 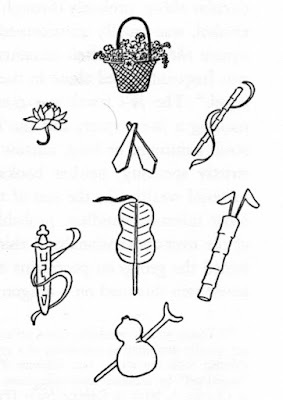 The Daoists tell stories of the eight Immortals, as a response to other faiths who talked about their Saints or Boddhisvatas.Here are their symbols. 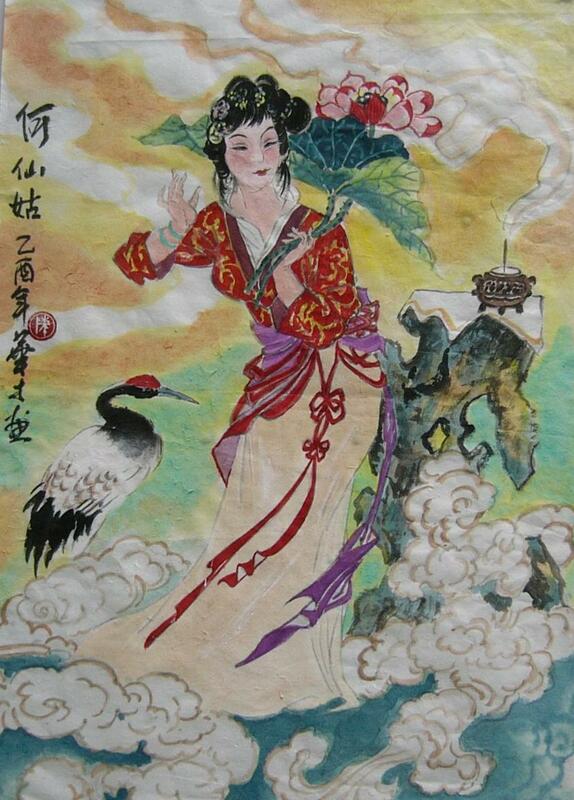 It is interesting to note that of the eight Immortals, six were men and one was a woman. The gender of the last one was apparently uncertain. 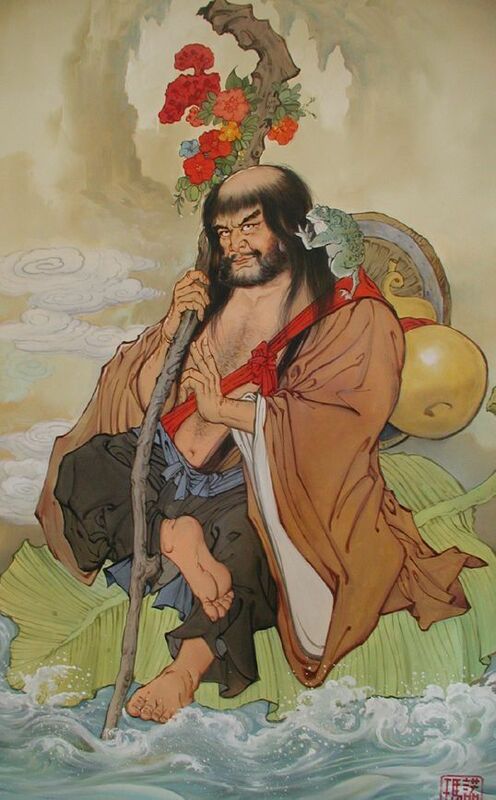 This is Lan Caihe, whose symbol is at the top, a basket of flowers. This individual was sometimes shown as a man, sometimes as a woman, and sometimes as 'a man who did not know how to be a man'. 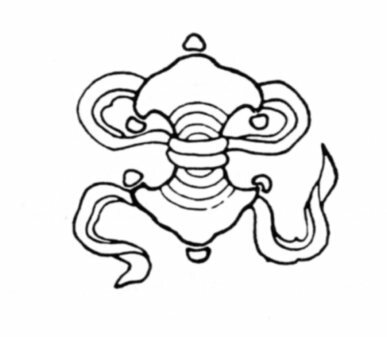 Next is a lotus, the symbol of He Xiangu, the only undisputed female of the group. Then are the stone castanets of Cao Guojiu, patron of theatre and actors. 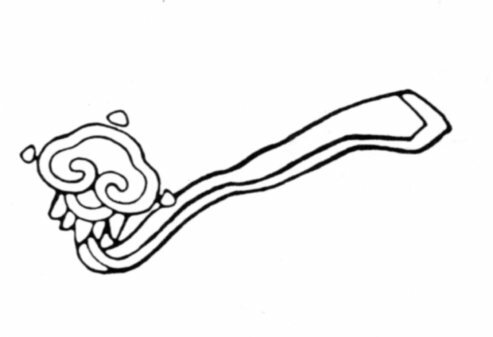 Then the sword of Lü Dongbin. 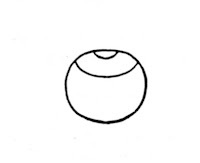 The 'fish drum' of Zhang Guolao, the oldest of the immortals. 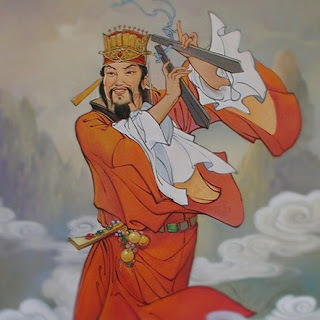 and the gourd and iron crutch of Li Tieguai. 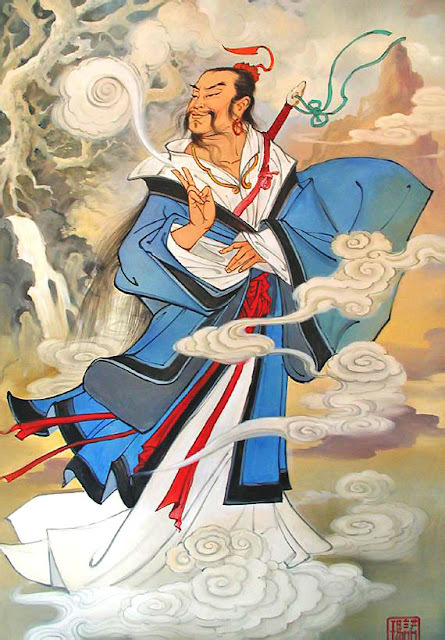 The Taoist Immortals were never shown in Manchu dress, but always in traditional Han clothing. If you look carefully at this robe, you will see the Daoist symbols being carried through the sky by the red bats of happiness. 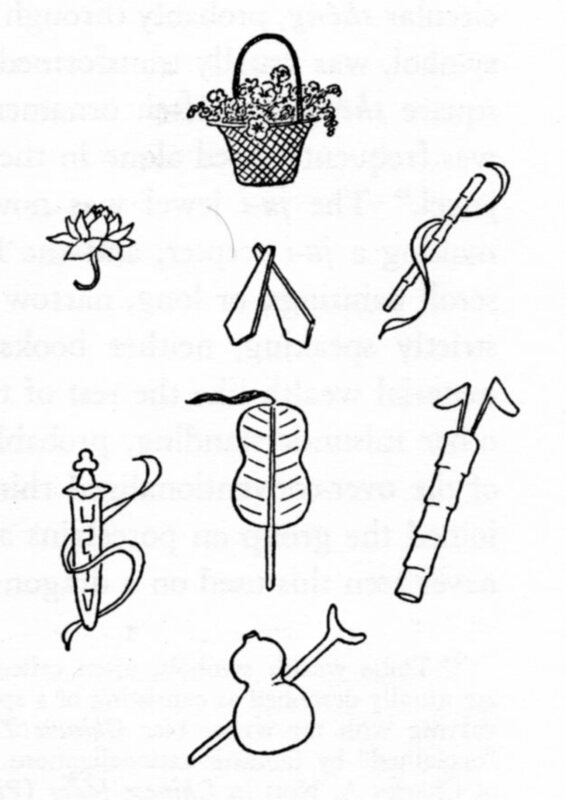 Another more important group of symbols, although found much less commonly are the 12 symbols of Imperial Authority. 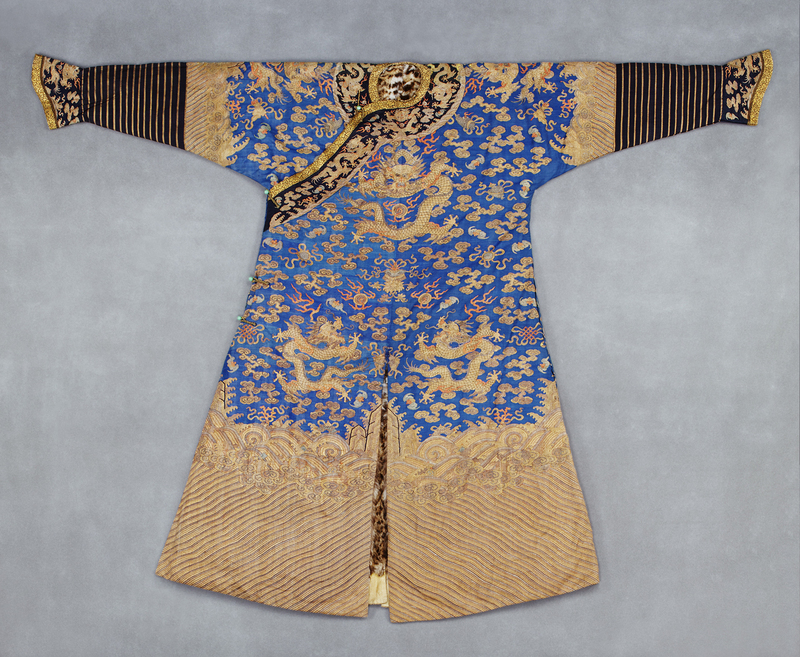 These were shown on the robes of Chinese Emperors for many centuries, and after 1759, were also added to the Manchu Emperors robes, although they were small and not prominent. These were never used by anyone else except the Empress and the Heir. 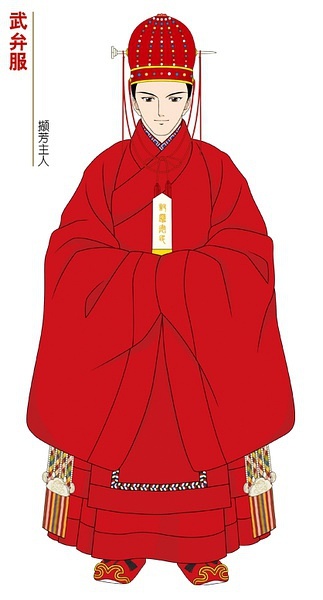 Let us take another look at the robe illustrated earlier. 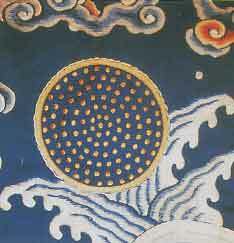 On the left shoulder above the dragon the red disk of the sun, with the three legged sunbird in it. This was originally a crow, when the archer Li shot down six of the seven original suns, but by the Qing Dynasty usually looked like a rooster. 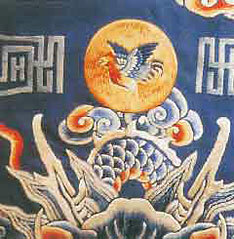 On the right shoulder above the dragon is the silvery disk of the moon, with the white rabbit who lives there. When the Moon rises, you can still see the outline of the rabbit, with his ears pointed to the right. On the front of the robe above the dragon are the stars, forming a constellation of three. This represents the sky, or Heaven. 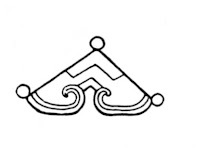 These three symbols are visible in the closeup above. 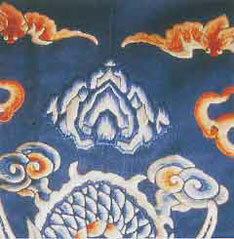 On the back above the dragon is the mountain which represents Earth. 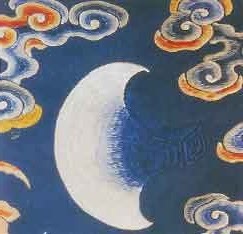 These four, Sun, Moon, Heaven and Earth are the objects of four of the principal sacrifices offered yearly by the Emperor on behalf of all under his care. 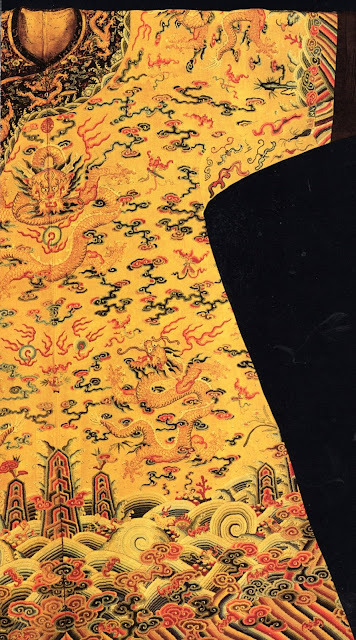 To either side of the dragon on the back of the robe are found a small dragon, symbol of Adaptability and the animal world. 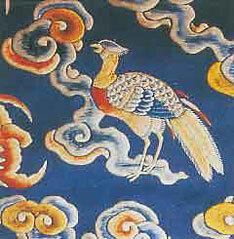 and the pheasant, symbol of literary refinement and of the bird world. 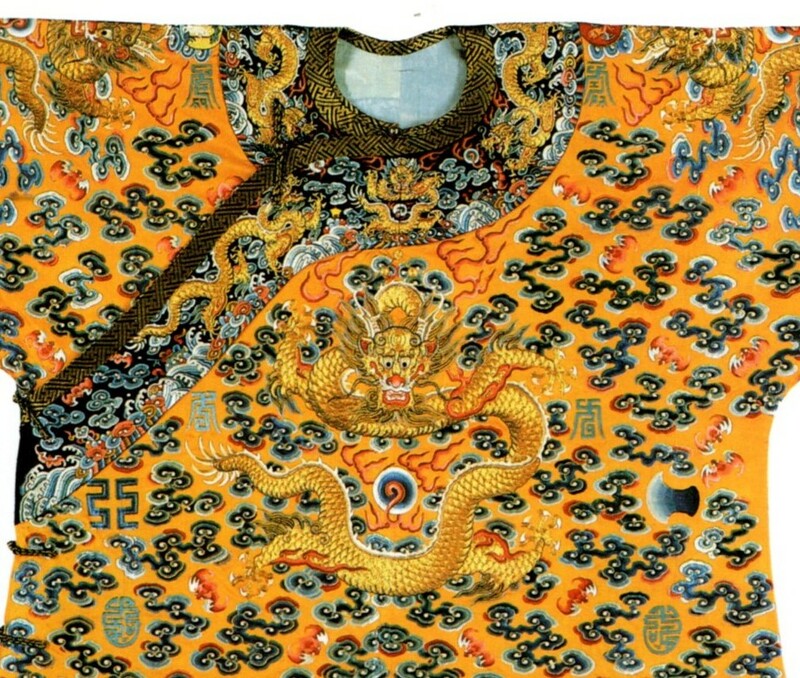 On the two sides of the dragon on the front of the robe, and visible above, are the Fu symbol on the right, which symbolizes Discrimination and Judgement. And onn the right side of the dragon on the front of the robe is the axe, symbol of the power to punish. 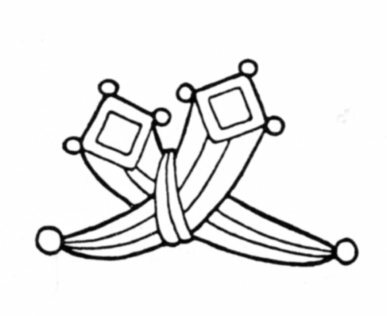 The last four are found on the skirts of the robe, one in each quarter, and together with the mountain already shown represent the five elements, metal, water, fire, wood and earth, the five directions, and the seasons. 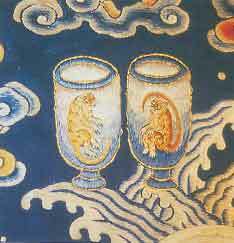 On the left side of the robe, next to the world mountain are the sacrificial cups, one with a tiger, the other with a monkey. 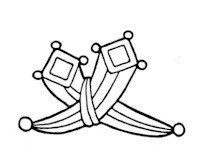 These symbolize filial piety, and spiritual responsibility. 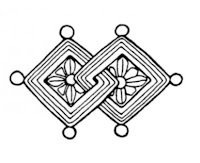 They also represent the element of metal, whose color is white, whose direction is west and whose season is autumn. 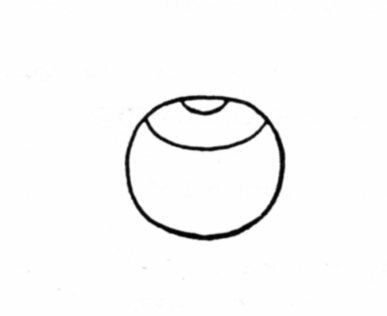 On the right hand skirt shown above, also next to the mountain is the water weed. This symbolizes purity. It also represents the element of water, whose color is blue/black, whose direction is north, and whose season is winter. 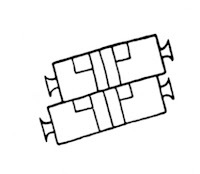 On the back tails, next to the world mountains are placed the last two symbols. The plate of millet, which represents the Emperors ability to feed his people, and the plant life of the world. It also represents the element of wood, whose color is green, whose direction is east, and whose season is spring. 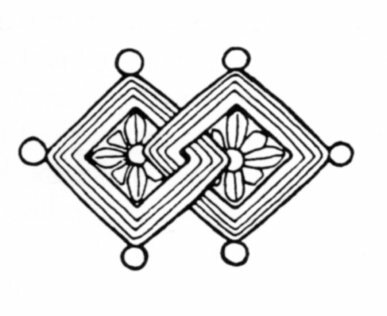 Flames, which represent brilliance. They also represent the element of fire, whose color is red, whose direction is south, and whose season is summer. Already represented is the element earth, whose color is yellow, whose direction is center, and which represents the solstices and equinoxes, the changes from one season to another. Thus you can see that the dragon robe represents the entire cosmos. Other auspicious symbols often join them in the sky, the most common being the red bats of happiness, well represented in these images. 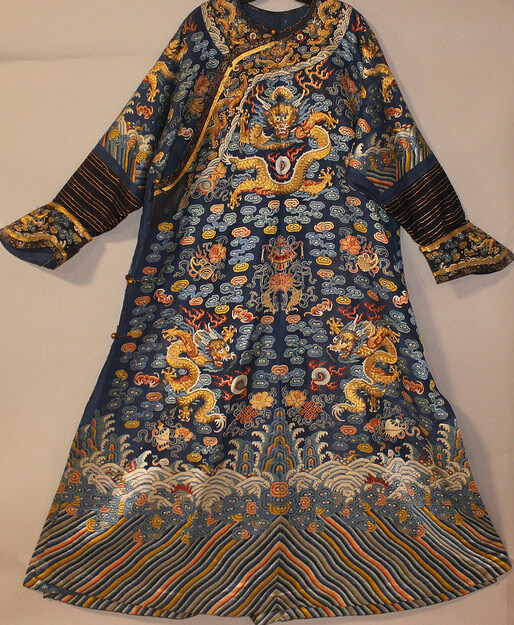 This robe has cranes flying in the sky. 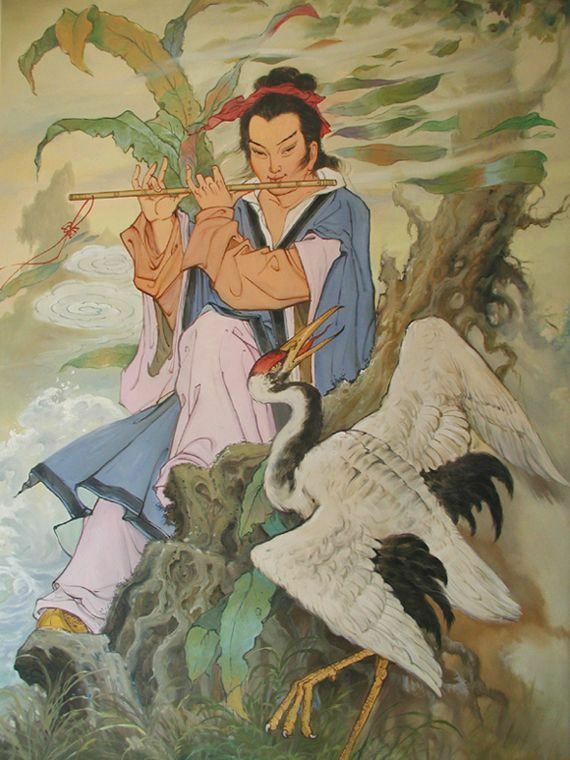 Cranes are symbols of long life and marital fidelity. 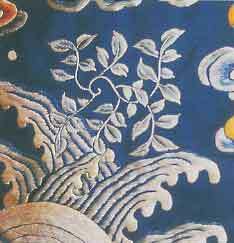 The Taoist symbols fill the sky and the Buddhist symbols float on the sea. The flowers of the four seasons also seem to be represented. 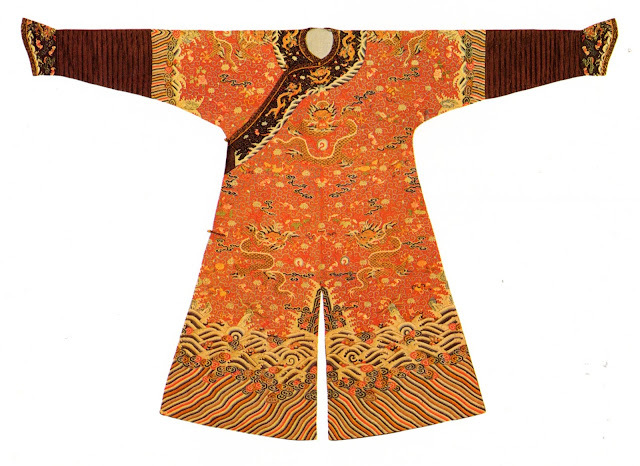 I believe that this is a woman's robe, from the width of the sleeves and the fact that there seems to be no slit in the center of the skirt. 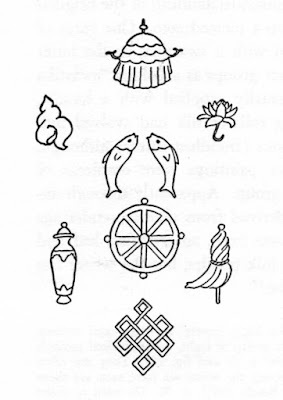 The 12 imperial symbols are absent. Thank you for reading, I hope that you have found this to be interesting and informative. 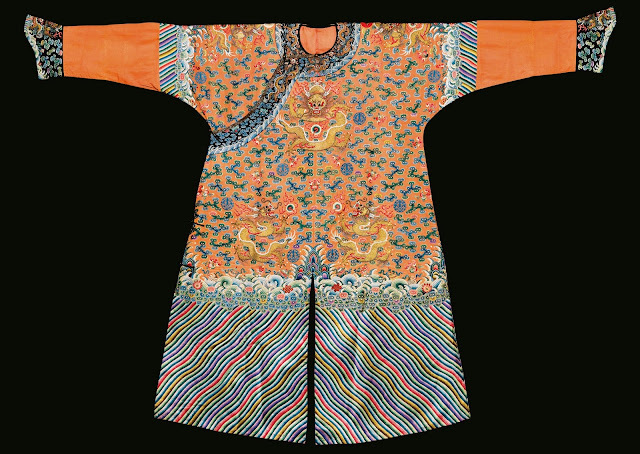 Luckily, many western collectors have bought many of these robes and they can be seen in collections and museums worldwide.